AIM combines a powerful stimulatory enzyme base with a surfactant that opens the soil and allows a greater penetration of air and water.The soil microorganisms stimulated by AIM and benefited by improved air and water infiltration enhance soil reactions, releasing bound nutrients and benefiting crop growth and development. Treated soils will drain excess water in heavy rains and also hold water better in drought conditions. Open soil allows deeper and wider root structure, which with better water management allows longer intervals between watering and may mean crop survival in drought conditions. NOTE: AIM is designed for use on soils without severe pH or salt limitations. Use AgPro™ RECLAIM for remediation of alkaline soils with excessive salinity. 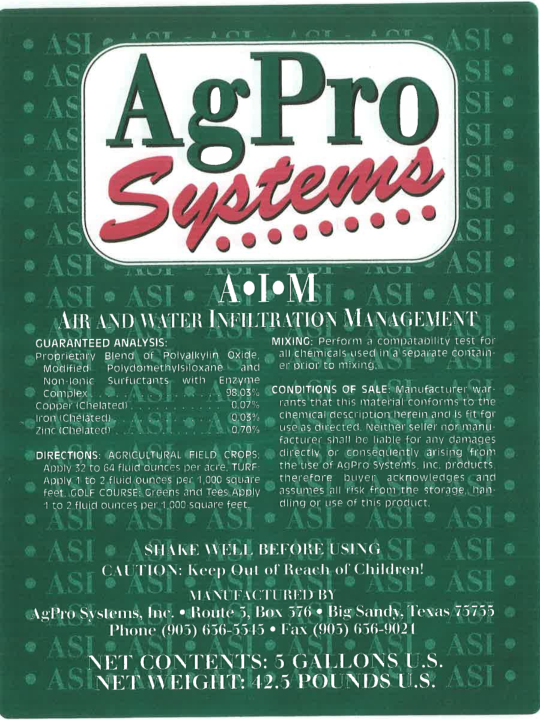 AgPro™ AIM is a unique and superior Air and Water Management TOOL which opens tight soils. AIM encourages excess water to move through the soil, allowing the soil to breathe. By stimulating microbial activity, AIM significantly reduces the various problems of soil compaction. Where soil moisture evaporation is high, AIM helps retain plant “available” moisture longer. AIM may be used with most pesticides and/or fertilizer products. AIM also contains biostimulants to reduce plant stress. Shake well and mix in enough water to distribute evenly. Can be tank mixed with most liquid fertilizers, herbicides, insecticides and fungicides. Use in conjunction with a good soil test and soil fertility program. Always conduct a compatibility test prior to mixing any chemicals. Applications of AIM through irrigation injection systems provide excellent results. Add AIM and mix with normal agitation.